Those of you who have followed me on twitter for a while or who know me in person will know that the London Film Festival is something I'm very passionate about. 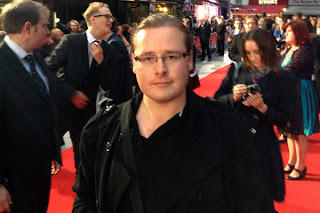 I first joined the BFI and became aware of the festival as a teenaged film student. Since then I have set aside the duration of the festival every year to squeeze in as many galas, screenings and events as I can. In 2010, I even covered the festival for two American websites. A lot of my reviews from that year are available here. This year I achieved a festival first by scoring tickets to the opening night gala - they're like gold dust - which also happened to be the European Premiere of Tim Burton's Frankenweenie 3D. Mr Burton was in attendance, as were cast members including Catherine O'Hara and Martin Landau. I took my younger brother - an animation student. It was his first ever movie premiere. Click to enlarge. Picture property of Charles Thomson. The film itself is a remake of sorts. In the 1980s Burton made a short film titled Frankenweenie - a live action piece which borrowed heavily from Frankenstein, about a boy scientist who revived his pet dog. It appeared as a special feature on several incarnations of the Edward Scissorhands DVD. He has now revived the piece as a feature-length, stop-motion, 3D spectacular. 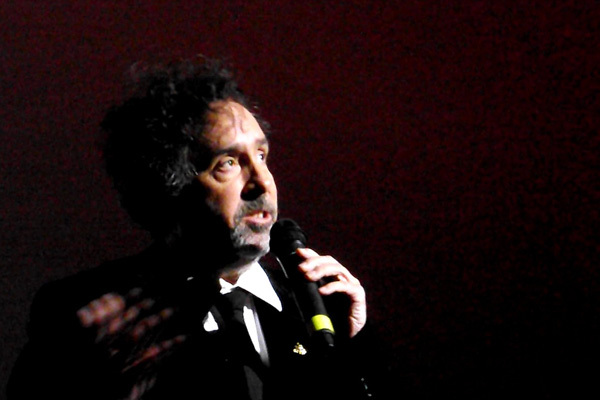 Tim Burton took to the stage to introduce the movie. I caught Burton's last offering - Dark Shadows - on a plane from Boston to Heathrow last month. Halfway through, I switched off and opted to watch a small animated plane chart our progress across a map of the Atlantic Ocean instead. His previous two features - Alice In Wonderland and Sweeney Todd - held my attention a little better but still seemed to be lacking that quintessential Tim Burton charm. So I am relieved to report that Frankenweenie is his best offering in years. Deeply moving in some places and hilarious in others, it is thematically similar to Edward Scissorhands, exploring the plight of the misunderstood outsider and the injustices they can face. The animation is beautiful and the script is clever enough to keep both kids and parents entertained. For movie buffs, it's also crammed with funny references to horror flicks and monster movies spanning all eras, from Bride of Frankenstein and Godzilla to Jurassic Park and American Werewolf in London. To top off the evening, I walked away with a goody bag from festival sponsor American Express. 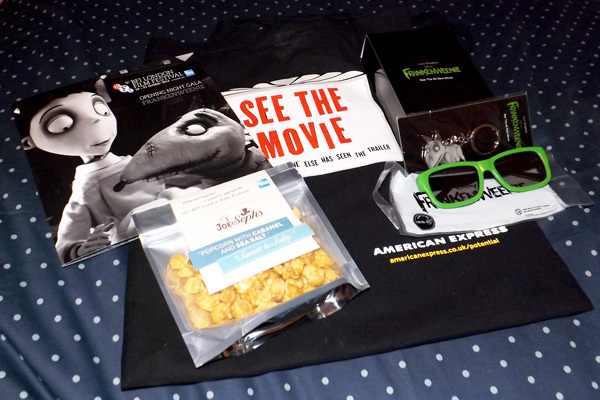 The American Express goody bag. He's some video my brother and I took from our second row seats inside the cinema. The crowd was entertained by a live organist until Tim Burton took the stage to introduce his ensemble cast.The movie received a rapturous round of applause as the credits began to roll.